I picked this up on VHS when it was issued back in the early ’80s, but, for some strange reason, it’s never had a DVD release. Now and then I’d check online on the off-chance that a DVD has finally appeared, but no such luck. 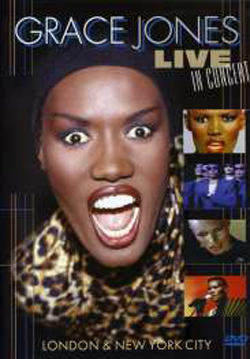 That is until the other week when I realised that the recent release ‘Grace Jones Live In Concert’ (also issued on CD) was in fact ‘A One Man Show’, padded out with three additional tracks – ‘Slave To The Rhythm’, ‘Love Is The Drug’ and ‘Crush’. Needless to say that I ordered my copy right away, but I was somewhat disappointed on its delivery to find that the beginning photo sequence from ‘A One Man Show’ had been removed (although part of it is used at the end of ‘Slave To The Rhythm’) and that, instead, it goes straight into the opening track ‘Warm Leatherette’. It also cuts out the credits that run at the end of ‘I’ve Seen That Face Before (Libertango)’, bringing proceedings to an abrupt halt about a minute before the track has finished. I would have thought that rather than butcher it as they have the company behind the release would have treated it in a much more respectful way, befitting of its brilliance. I suppose I was expecting a remastered version (quality is no better than the VHS), coming complete with an informative booklet to accompany the disc. Instead they inexplicably came up with the most ordinary (not to mention misleading) of titles for what is an extraordinary visual feast, whilst failing to even source its origin in the sleevenotes. It had crossed my mind that I might have unwittingly purchased a bootleg, but Immortal is a bona fide label specializing in low budget releases. All in all it’s more a case of a pretty poor show than ‘A One Man Show’, but at least there’s something, if not quite the right thing, on DVD after all this time for those who, unlike myself, don’t have the option of sticking with their old VHS copy. My foster brother took me to see this film at a film art house here in Boise, Idaho back in 1987. I was blown away ! Although it had been on the market for a bit, the chance to see it big screen was tops and I sat mostly agape at the Jean Paul Goude Grace Jones marriage. The commercial they did together for Citroen Car is perhaps my favorite commercial EVER – never before or after have I seen the perfect balance of art, sophistication and style. Thanks to share this Greg, brings up very inspirational memories ! You’re right, it’s a shabby DVD (by some dodgy Dutch company?). It’s odd that seminal works like this (another example might be the Kate Bush video collection) have never had a decent release on DVD. Problems with the rights, I should imagine. 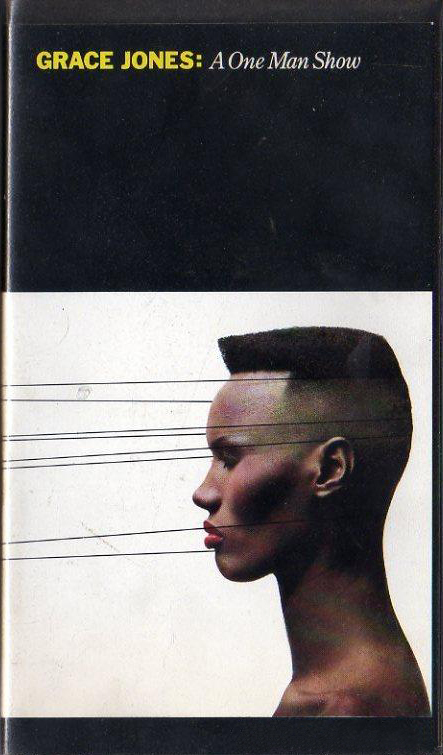 Certainly very odd after a ‘comeback’ that Grace Jones should see such a mess of a DVD being released. There is actually a copy of “A One Man Show” at The pirate bay. I have not seen it, though.